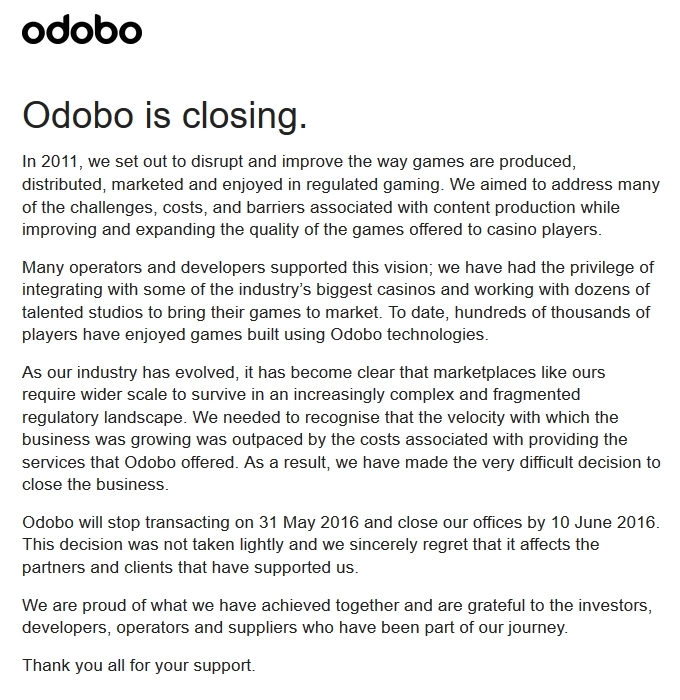 Online slot game developer and casino marketplace Odobo has officially closed for business. The Gibraltar-based gaming business cited high costs and a fragmented market for the key reasons the business failed. The company’s website has been replaced with a single message explaining the reasons why Odobo is shutting its doors. Stating a need for a ‘wider scale’ to survive in an industry full of regulatory hurdles. Odobo also realized that the costs of running the company ‘outpaced’ the revenues they were able to generate. The management team have been seeking an investor or gaming company to pick up the business and move it forward. However there has not been any indications that a potential buyer is interested. They expect to stop transacting on May 31, 2016. Odobo developed several popular slot games, including The Oddventurers, Akaneiro and Rampage Riches. All were available across mobile, tablet and desktop.